Many things can change as people age, rendering it necessary to make adjustments. Some changes are inevitable, and there is nothing that can be done about them. Other changes can be made easier with just a few small adjustments. Those who want to retain their independence as they age and stay living at home can modifications to their home and daily care routine to make it possible. Over time, the bones and muscles within the body weaken, making it much more difficult to maneuver about the house. Those with stairs in their home may find it extremely tough to make their way up and down the steps each day. A stair chair should get installed to combat this problem. Seniors can simply sit in the chair and get lifted up the stairs to their destination without having to walk the full way. It allows them to still have their independence and keep rooms the same in the house without having to make changes to their chosen setup. Falls are easier to suffer as the body ages. An alert system should get set up so people can notify someone and get help if they fall and cannot get back up again. Life Alert and similar options send out a notification to the company who can then notify a contact person, such as a family member who lives close by, of the fall. They will send out help immediately. It allows seniors to stay in their homes without fear of falling and never having anyone know or find them. Some people have a daily care routine they’ve followed for years. They may brush their teeth, take a shower, brush their hair, and so on. This routine needs to change as people age, such as switching out brushing hair for trying hair regrowth methods or putting in dentures rather than brushing teeth. A simple shower might no longer be possible, as grab bars and shower chairs need to get installed inside to allow older adults the ability to get in and out themselves. This change in daily care routine is especially important when it comes to medications that need to get taken. If certain pills need to get taken at a particular time, that needs to get added to the routine. Some may require a meal while others only need water. Since memory also goes as people age, this routine should get written down so seniors can follow it on their own without needing help. A phone is highly necessary when seniors live alone. They need to be able to get ahold of someone should something happen. While the Life Alert system notifies someone in case of a fall or medical emergency, it does not send out a signal in every situation. A senior-friendly phone with large buttons and an easy-to-use interface is the best option for communication. Fancy smartphones aren’t necessary, as most older adults find them difficult to use anyways. A simple flip phone would suffice. 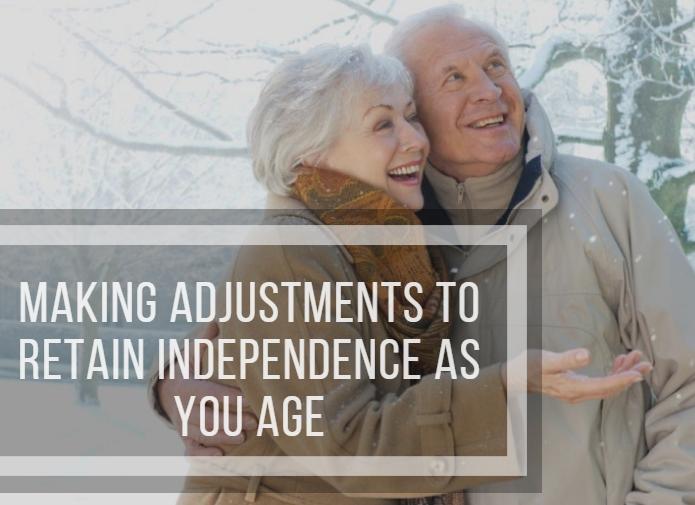 Making adjustments to retain independence as you age is necessary for any seniors looking to stay in their homes and remain out of nursing facilities. Many older adults want to continue living the life they’ve made as long as they can. These adjustments will allow that to happen, ensuring a safe and secure living environment.